14" Gas Powered Floor Concrete Saw. Powerful 11 hp Honda engine. Weighs 275 lbs to provide straight cuts. Cuts to 4 1/2" deep. Equipped with a depth indicator. Diamond blades or abrasive blades are available. Equipped with water hook-up for diamond blades and dust control. 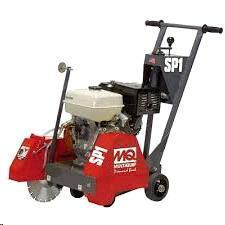 * Please call us with any questions about our con floor saw 14 inch push 11hp rentals in Oak Grove MO, Blue Springs MO, Independence MO, Lexington MO, Odessa MO, Independence MO and Western Missouri.